Essential oils are the volatile essences of plants that create unique, wafting fragrances. They can be extracted from any plant’s flowers, bark, stem, leaves, roots, and sometimes its fruits. No matter the source, these oils are complex mixtures, often containing up to 60 different substances—some good for skin, others not so good. The volatile fragrant portion of plants is what makes essential oil for skin problematic—but these compounds can be beneficial, too. This duality makes things confusing for people because the truth is that although the oils smell wonderful, what’s good for your nose is rarely good for your skin. Many companies who sell products that contain these oils brag that they’ve been used for aromatherapy for thousands of years. But modern science has revealed the truth about how fragrant oils cause problems for skin: What’s ancient isn’t always good! Regrettably, the simple truth in beauty is there isn’t a best essential oil for skin. Some components of these oils are indeed beneficial for skin. For example, many of them are rich sources of potent antioxidants like caffeic acid and rosmarinic acid (among many others). Others contain antibacterial ingredients that protect against visible skin problems related to fungi, yeast, and other topical troublemakers. Sounds good, right? But in the long run it’s not good for skin, because most of those compounds can also significantly irritate and damage skin. Common examples include fragrance ingredients like limonene, citronellol, eugenol, and linalool, all present in many fragrant plant oils. The positives just don’t outweigh the negatives. Some essential oils for acne-prone skin such as rosemary, lemongrass, thyme, cinnamon, citronella, and tea tree oils do have research showing them to be helpful. But they also cause significant irritation and haven’t proven to be as effective as the gold standard active ingredient for acne, benzoyl peroxide (which research shows can even reduce redness!). 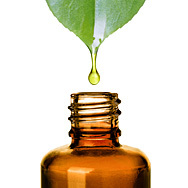 In terms of essential oils for aging skin, none can successfully deal with the appearance of wrinkles, brown spots, loss of firmness, or address the need to exfoliate skin, especially in comparison to the hundreds of beneficial, non-fragrant plant extracts and vitamins that have no risk of causing irritation. Unfortunately, as you now know, there isn’t a best essential oil for skin. We wish that wasn’t the case, but to one degree or another, all of them pose risks when applied to skin. You can find research showing that certain amounts (such as 0.1%) of these oils are non-irritating, but this research doesn’t take into account the fact that lots of skincare products contain more than one essential oil, or far more than 0.1%. It also misses that some people use multiple fragranced skincare products, which adds up to a higher risk of irritation than what research has shown is acceptable. Another really important fact: Skin is very good at hiding when it’s being irritated. So, even if you don’t see a reaction, the damage is still occurring beneath skin’s surface, cumulatively leading to problems you will see later on. Irritation is pro-aging, the opposite of what most adults want from skincare. As we mentioned above, using essential oils for skin care is a bad idea because so many of them hurt skin more than they help. All of the citrus oils, including lemon, lime, tangerine, grapefruit, mandarin, and bergamot, are a big problem for all skin types. Also extremely problematic are mint oils such as peppermint, wintergreen, pennyroyal, and balm mint. In a similar vein, avoid camphor oil, which is a potent irritant. Despite their reputation for being soothing (and they are if you inhale them rather than put them on your skin), flower-derived oils like lavender and rose are also problematic. Ironically, both of these oils contain skin-calming substances, but those are present along with the problematic fragrant substances—you can’t get one without the other. There are many wonderful, gentle, and proven non-fragrant­ oils and plant extracts to consider for various skin types and concerns. Natural ingredients can be great for skin if you avoid products that also contain natural fragrant ingredients—exactly the approach Paula’s Choice Skincare takes with each and every one of our products. Our RESIST Omega + Complex and Moisture Renewal Oil Booster are two examples of non-fragrant, non-irritating products loaded with natural ingredients research has shown are good for skin. There are too many beneficial natural oils and plant extracts to list here—this article would go on for pages and pages! Instead, our advice is to avoid any skincare products that contain fragrant plant oils and extracts. This is relatively easy to do by simply shopping with your nose (paying attention to lack of aroma) and double checking the ingredient list for anything fragrant. You can also look to brands like Paula’s Choice Skincare, which does the detective work for you! In the end, the best essential oils for skin are the ones you don’t use on your skin—but you can enjoy their aromatherapeutic benefits in other ways, such as from scented candles, sachets, or burning oils in a diffuser. This approach will make your nose and your skin happy!